"There is no satisfactory plan that is put before us concretely yet," Erdogan told a parliamentary meeting of his AK Party. "Of course we are loyal to our agreements, our promise is a promise. But our patience is not limitless." He added that if terrorists are not removed from Syria's Manbij in a couple of weeks, Ankara will run out of patience. "If the terrorists do not leave Manbij in a few weeks, then our patience will end. The United States must keep Turkey's data on Syria's promises, otherwise Ankara itself will take steps to eliminate the threats to national security," he said. Turkey wants Syria's Manbij to be cleared of the US-backed Kurdish People's Protection Units (YPG) which Ankara considers a terrorist group. In December, the YPG announced its withdrawal from Manbij and called on Damascus to take control of the city to protect the area in the event Ankara launched a military operation against the Kurds. In early June, US Secretary of State Mike Pompeo and Turkish Foreign Minister Mevlut Cavusoglug agreed on a roadmap related to the pullout of YPG forces from Manbij in order to maintain stability in the area. 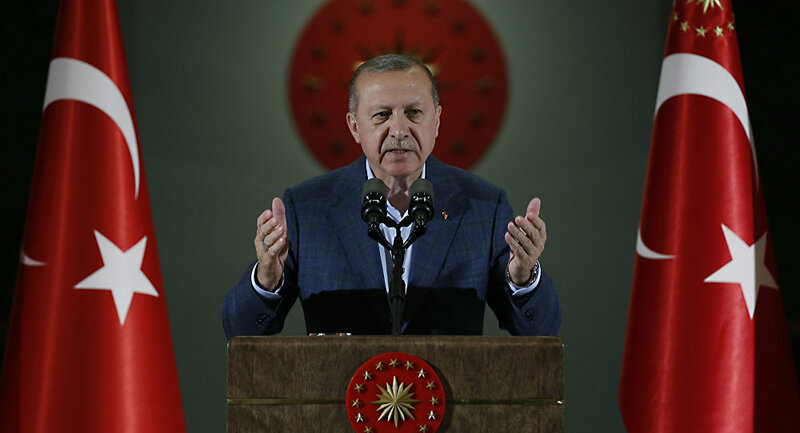 Turkish President Recep Tayyip Erdogan accused the US and EU of double standards, calling their decision to recognise Juan Guaido as Venezuela's interim president illegal. "Is Venezuela your instrument? There the president came through elections, what right do you have to appoint another? And where is democracy, how can this be accepted? And the EU immediately appeared. You are talking about democracy, but you are in favour of a wrongful decision. We do not accept the world where the one who is stronger is right, we are against such an imperialist position, " Erdogan said. The situation in Venezuela, which has been struggling to overcome a political crisis amid the opposition's refusal to recognize last year's re-election of President Nicolas Maduro, significantly escalated on January 21 when the opposition-controlled National Assembly declared the president an usurper. Canada, the United States and many of their allies have recognized Guaido as interim president of Venezuela.